As you have surely heard by now, the conceit of director (and Public Theater Artistic Director) Oskar Eustis’ al fresco production casts the titular character as Donald Trump (in the person of Gregg Henry of TV’s “Scandal”), so Paul Tazewell’s costumes are, of course, resolutely modern dress without a toga in sight. There’s been outrage from some quarters (including two of the Public’s sponsors, Delta Airlines and Bank of America, both of which have subsequently withdrawn their funding) presumably about the propriety of presenting our current commander-in-chief in such an unflattering light, and depicting his graphic assassination to boot, with the implication that there may be some condoning of the heinous act. But for anyone entertaining that latter interpretation, this is far from the case. The motive for the killing in Shakespeare’s play is that Caesar, recently returned to Rome after victorious battle, has ambitious notions of accepting a crown, or so the conspirators, including Cassius (John Douglas Thompson), Casca (Teagle F. Bougere), and eventually Caesar’s beloved ally (and, according to Plutarch, possible son) Brutus (Corey Stoll) fear. In any case, the killing of Caesar in the Senate (midway through the play) is staged with utmost gravity, and the sequence -- choreographed by fight directors Rick Sordelet and Christian Kelly-Sordelet -- is quite harrowing and sobering. From this point on, a staging more true to Shakespeare’s play seems to kick in. The Trump scenes, in any case, elicit more “Saturday Night Live” chuckles than chilling parallels to the present administration..
Thompson -- most adept at performing American Shakespeare -- is a magnificent Cassius, and Corey Stoll as Brutus, though less verbally dexterous, is only a degree less commanding. 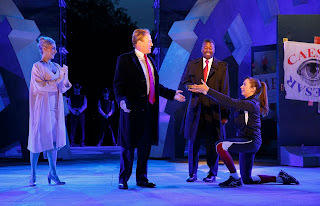 As the worried wives of Caesar and Brutus respectively, Tina Benko is spot-on as a Melania-accented Calpurnia and Nikki M. James is very impressive as Brutus’ wife Portia. I was rather less enamored of Elizabeth Marvel’s Marc Antony. Fine actress that she is, I didn’t understand the concept of having her in woman’s attire, referred to by other characters as “she,” and yet still addressed as Marc Antony. Her manipulative “Friends, Romans, Countrymen” speech is well articulated with the large cast scattered all around the Delacorte as noisy rabble, but her reading struck me as rather shrill and obvious. 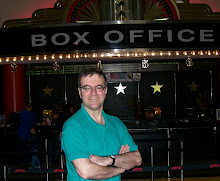 The blue chip production team includes David Rockwell’s dominating Washingtonian gear-like set design, Kenneth Posner’s lighting, and Jessica Paz’s lighting are all state-of-the-art. 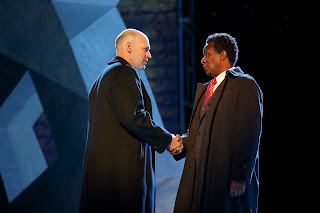 Center: Corey Stoll and John Douglas Thompson in The Public Theater’s Free Shakespeare in the Park production of Julius Caesar, directed by Oskar Eustis, running at the Delacorte Theater in Central Park through June 18. Credit: Joan Marcus. I wanted to hear a real person's assessment of all this. I found the concept to be a gimmick -- granted, a fun one. But as you mentioned (and I think the sponsors missed) the point of the play is what happens after. It seems as thought this show is always done with whomever is in office. Can't remember who did the African-American Julius when Obama was in office and there was one a few years ago with the Italian prime minister whose name I can't spell as Caesar. Seems silly to make a big deal of it now. But sometimes it works better than others.